The need to have osteoarthritis explained is critical to its understanding. The dictionary defines is as “a form of arthritis, occurring mainly in older persons, that is characterized by chronic degeneration of the cartilage of joints”. When we, as humans, are conceived, long before birth, our bodies are blessed with the DNA blueprints for development of a highly specialized cartilage that literally “coats” the joint surfaces throughout our bodies. This cartilage is called “hyaline cartilage”. It is located on the surfaces of articulating joints throughout the body. Hyaline cartilage differs significantly from other cartilage types in that it is, in the beginning, an extremely plush, soft and blemish-free material. It is designed to move with little-to-no friction when in contact with opposing surfaces. Examples of this are in the knee and hip, where you see this same cartilage type on both the femur (thigh bone) as well as the tibia (shin bone) or acetabulum (socket of the hip) joint surfaces, so that they can move in a very fluid fashion. Hyaline cartilage also holds water molecules well and that gives it its chock-absorbing nature. It’s almost like walking on a “water pillow". If you’ve ever separated a chicken leg from the thigh and saw the “knuckle” of the joint, the shiny, smooth white surface is the hyaline cartilage “coating”. 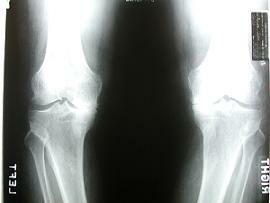 How is osteoarthritis explained compared to the other forms of degenerative joint diseases? Well, osteoarthritis is widely considered to be the “garden variety” arthritis which is, in the majority of cases, typically brought about by long term wear and tear of the joints through the aging process as well as through usage. Weight-bearing joints, such as the knee, hip and ankle, tend to wear out at a faster rate than non-weight-bearing joints such as the elbow or wrist. A definite correlation has been established between a person's weight, and the risk, rate and severity of osteoarthritis development in weight-bearing joints. That being said, heredity can also play a significant role in osteoarthritis. Think of hyaline cartilage as similar to the “tread” on a tire. At birth, there is a pre-determined thickness of cartilage, which does indeed wear down over time, just like the tire. In osteoarthritis the cartilage covering, just like the tire tread, can wear down in an uneven pattern. 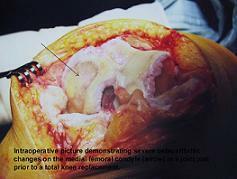 It is typical to see one side of a knee joint, for example, wear out faster than the other. When you see someone with osteoarthritis walking either bow-legged or knock-knee’d, it’s because of these wear patterns. As joint surfaces wear down and age, they become less able to hold water, making them increasingly more brittle. The earlier stages of osteoarthritis shows that the cartilage begins to crack and flake causing defects in the otherwise soft plush surface. “Pot holes” can develop and eventually, the underlying bone can become exposed, making the joint more and more painful to bear weight on. Depending on the joint(s) involved, osteoarthritis symptoms can range from aches and soreness, together with mild swelling in the milder forms, to severe, disabling pain with significant swelling and decreased joint mobility. In the weight bearing joints of the , knee and ankle, walking can become difficult and many people walk with a noticeable limp at this stage of osteoarthritis.